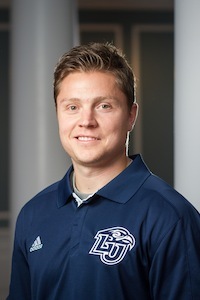 Other info: Coach McQuillan is a graduate and current employee of Liberty University as the assistant director of Club Sports. He graduated from Liberty in 2007 earning a business degree with a specialization in finance and earned his MBA in 2011. Coach McQuillan and his wife, who he also met at Liberty, have been married for 7 years and have two children. Max who is 2 and their new baby girl named Charlie. During his freshman year at Liberty University, Coach McQuillan realized his true passion for the sport of lacrosse. He played three seasons on Liberty’s Lacrosse team before it was dismantled in 2007. While on the team, Coach McQuillan earned all-conference recognition for 2 seasons while also holding the title of Team President and Captain. Since being named head coach in 2011, the men’s lacrosse team has a record of 44 wins and 14 losses in its first 4 seasons, including an SELC (South Eastern Lacrosse Conference) Div2 Championship in 2013. Liberty enters the 2015 season with the national rank of #21 after just one year competing within Div1 of the MCLA (Men’s Collegiate Lacrosse Association).